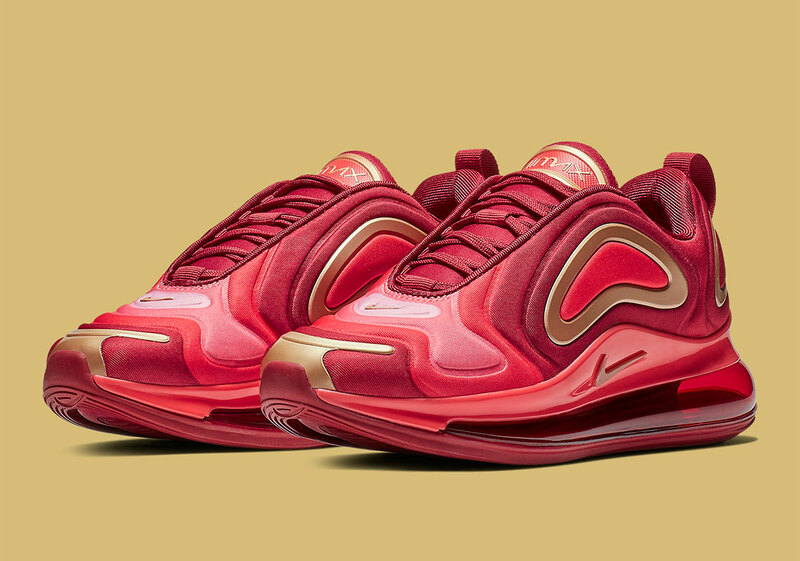 It seems as though almost every day we have a new Nike Air Max 720 colorway to show you all. It makes sense considering the shoe is beginning to roll out to the masses. It's Nike's latest iteration of the Air Max, which sees the air bubble unit wrap all the way around the shoe in a unique way that has never been seen before in a Nike shoe. It's a pretty funky looking silhouette and so far the Beaverton brand has made some pretty cool colorways to get us excited. If you have a kid who needs new shoes, or perhaps are a kid stumbling onto this website, then this new Air Max 720 colorway could be for you. As you can tell, the upper is covered in crimson red which makes sense considering the colorway is called "Team Crimson." There are gold highlights on the tongue, toe, and Nike Swoosh which ends up giving a much-needed pop of color. According to Sneaker News, these kicks will be coming out on Thursday, February 28th for $160 USD. Once again, these are coming in GS sizes only so if you wear an adult shoe size, you'll have to pass. They will be available on the Nike SNKRS app as of 10 A.M. EST on the day of release.